Throughout the year, as part of our Herbal Production and Processing class, we’ve chosen a single plant to engage with deeply – from its propagation, through cultivation, harvesting, processing, and finally its therapeutic application. This past week, we assembled to talk about our experiences in this process of growing and medicine-making, and ultimately, in getting to know these plants as allies. Mine was a funny journey. Earlier this year, on a field trip to the Haliburton Biodiversity Project with our botany instructor, Kristen, I was introduced to Helenium autumnale var. grandiflorum. Only I didn’t know it as that at the time, because I was busy snickering about its common name: mountain sneezeweed. Thinking about it now, I’m not sure that I even really saw it at the time – not properly, not in the way that a few months spent squinting at anthers and involucre bracts and trying to divine personality from a teetering stem will do. A hawthorn (Crataegus) leaf triptych. Hawthorn is an ancient shrub: accounts of its use date back to the ancient Greek herbalist Dioscorides in the first century A.D. 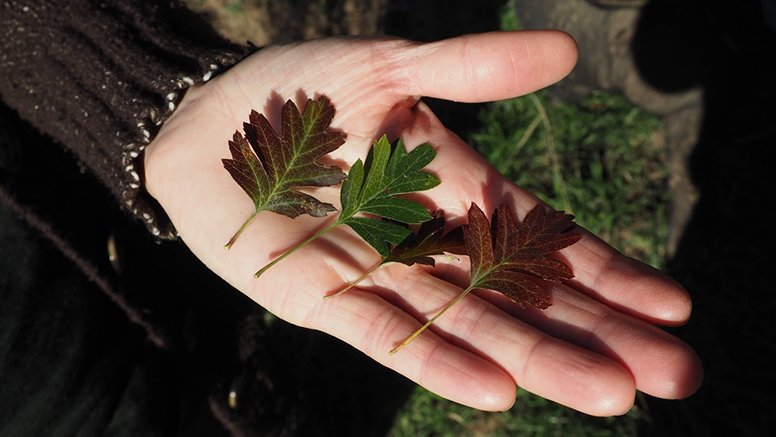 The dried leaf can be tinctured or taken as a tea; hawthorn is still commonly used today as a heart tonic. So it was the name and the story that got me, at least to start. The Garry Oak Ecosystem Recovery Team, of which Kristen is a member, has written about the Victoria area at the time of colonial contact. Hudson’s Bay Company Chief Factor James Douglas, landing in 1842 at present-day Clover Point, in Victoria, remarked to a friend that he “delighted in ranging over fields knee deep in clover, tall grasses and ferns reaching above our heads, at these unequivocal proofs of fertility.” This lush meadowland was carefully managed by Indigenous peoples (specifically the Coast Salish Lekwungen at Clover Point), but because it did not resemble the sort of agriculture familiar to the colonizers the lands were assumed to be unused and unproductive and were sweepingly converted to farmland. 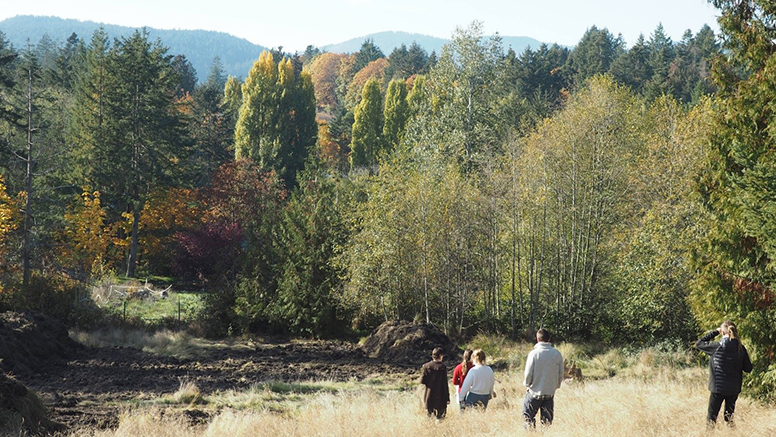 Some of the most desirable areas for agriculture were the Garry Oak-associated wetlands (or “wet meadow” habitats). The swiftness and completeness of the transformation left few examples of this wetland behind – these days, the term “Garry Oak meadow” conjures images of a rockbound landscape, stony and dry, giving only a limited window into the past diversity of Garry Oak ecosystems. My plant, Helenium autumnale var. grandiflorum, was one of the species that thrived in these mostly-forgotten wetland margins and riparian areas. Admiring the autumn colours at Tiny Tree Herb farm. Visible in the lower left is bare soil from a digging project to daylight a spring-fed stream that runs through the property; plans for a network of wildlife ponds fed by the stream were designed by Hatchet & Seed. And so it was that at the beginning of May I carried a ten centimeter pot with a spindly but energetic-looking sneezeweed plant out of Saanich Native Plants, Kristen’s nursery and consulting business. I set it in my backyard next to one of the raised garden beds, still in its pot. And then I did some research, focusing on the parts that I could see. The botanical description informed me that its “[b]asal leaves [are] soon deciduous; stem leaves alternate, numerous, glandular-dotted, usually wing-margined at the base, lanceolate, narrowing to an unstalked or almost unstalked base, shallowly toothed or nearly entire, 3-15 cm long, 5-40 mm wide.” This was good, but the machine-gun thump of the sentence didn’t really befit or capture the whole of the plant’s personality. Its leaves were lanky and elegant, with plenty of character to communicate changes in mood; the flowers, when they emerged, looked like cartoon badminton birdies. But there is some woe in the plant’s history, too. Its genus, Helenium, has its roots in the ancient Greek word helenion. Also known as Helen’s flower, Helenium blooms are said to have grown wherever Helen of Troy’s tears touched the ground. In Greek mythology, Hector, the eldest child of King Priam and Hecuba, was heir to the throne of Troy and the great hero of the Trojan War. But after he killed Patroclus, Hector was slain in battle with Achilles; Homer’s Illiad ends with his funeral, as Helen weeps and – I assume – sneezeweed (or more probably elecampane) blooms. 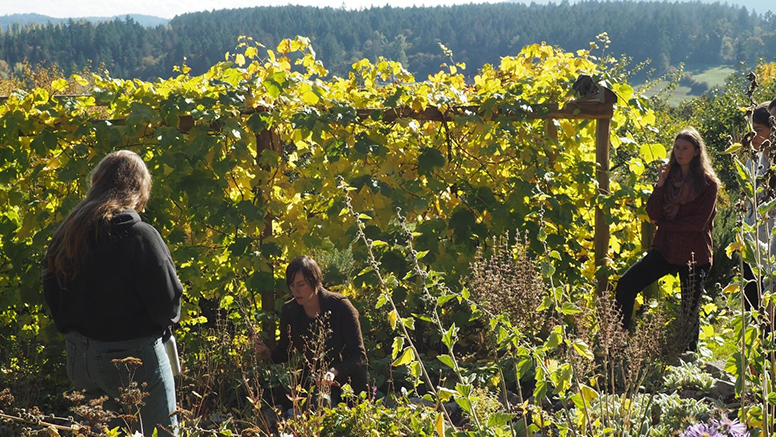 Fall pruning in front of the grape pergola at Ravenhill Herb Farm. My backyard is sunny, and the sneezeweed soaked it up. Although the authoritative Flora of North America recognizes only a single variety of mountain sneezeweed, here in B.C. two different varieties have been distinguished (var. grandiflorum and var. montanum), and mine, the rarer, blue-listed species, seemed to revel in its backyard uniqueness by shooting up to keep pace with a sunflower that had volunteered in the neighbouring bed. When the two burst into flower later in the summer, my back yard was a profusion of yellow Asteraceae blooms that saluted the sun. Sneezeweed is not a plant that sees much use from contemporary herbalists. Traditionally, however, its leaves and flowers were dried and ground into a snuff that would cause the insufflator to sneeze uncontrollably (the Menominee tribe of present-day Wisconsin called a related variety “aiatci’a ni’tcîkûn,” which means “sneezing spasmodically”). While probably convenient for mischief-makers, this powder was also thought to be useful for relieving nasal congestion, or else for ridding the body of evil spirits. The plant’s aerial parts can be used to make an infused oil, salve, liniment, or poultice, to be applied topically for sprains, sore joints, bruising, torn ligaments, or general muscular-skeletal inflammation. The entire plant has also been used in a decoction to treat fever and chills, and in a sweat bath to treat “dropsy” (edema) and swelling; or in a tea for the treatment of intestinal worms and parasites. (L-R): My botanical illustration of Helenium autumnale var. grandiflorum (mountain sneezeweed); bottles of sneezeweed flower essence with the dried flowerheads in the foreground; my sneezeweed plant pressing, taken from the plant in my back yard. This all sounded fine, but I was a bit wary of the plant’s strong actions as a vermifuge and anti-parasitic. Because of the hepatotoxic pyrrolizidine alkaloids it contains, internal use is generally discouraged, as safer herbs can offer these same actions without the risks or side effects. And it looked a little brash, back there in the garden. I was looking for a gentler medicine. I decided instead to make a flower essence: a medicine that, though it is taken internally, operates on an energetic rather than a biochemical level. Sneezeweed flower essence is said to help guard against excessive self-criticism, and to strengthen one’s love of self. On a sunny day in August, I harvested some flowers from the plant, which by this time boasted about a dozen of them in various stages of showiness. Being careful not to touch them directly, I laid the flowers on the surface of a bowl of water and left it for a few hours in the summer sun. After extracting the flowers, I decanted the water into tincture bottles and then topped them up with brandy to act as a preservative. 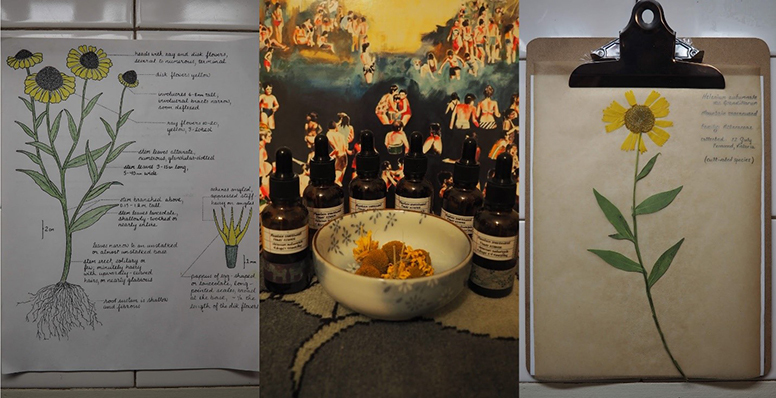 I gave a bottle of the flower essence to each person at our final Herbal Processing class – but on the counter at home, for personal use, I still have a full bowl of dried flowers I’ve ground into a powder. The next time I have a stuffy nose, I know what to do.